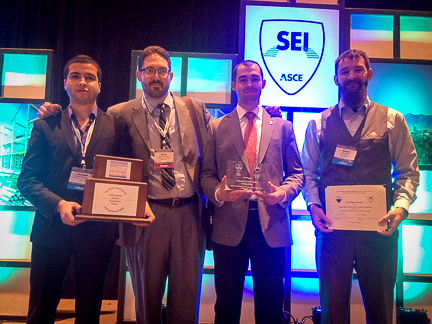 CCE student teams won first place in two competitions at the Geotechnical and Structural Engineering Congress held February 14-17, 2016 in Phoenix, Ariz.
Mentored by faculty member Ben Mason, the GeoVideo student team of Youssef Bougataya, David Bailey, Rachel Adams, and Sharoo Shrestha placed first for their video, “Soil Structure Interaction During Earthquakes.” The GeoVideo competition received 10 entries with six invited to present at the congress. In the GeoPrediction competition, the CCE team of Bougataya and Nathan Jones won first place out of nine presenting teams and 18 international submissions. For the competition, teams were required to predict the deflection profile of a 90-foot-deep, tied-back excavation in downtown Seattle, constructed in 2004. In scoring, the prediction and documentation in the report was worth 75 percent and the presentation of the work was worth 25 percent. The team was advised by CCE faculty member Armin W. Stuedlein and three geotechnical practitioners and professors scored the presentations. Each team had 5 to 10 minutes to present their work and answered technical questions for 5 minutes following presentations. Arizona State University took second place and Middle East Technical University of Ankara, Turkey placed third. The congress was unique this year in that the Geo-Institute (G-I) and Structural Engineering Institute (SEI) of the American Society of Civil Engineers (ASCE) came together to create the first-of-its-kind congress by combining both institutes’ annual conferences into one event. Congratulations to the teams on an excellent job well done! 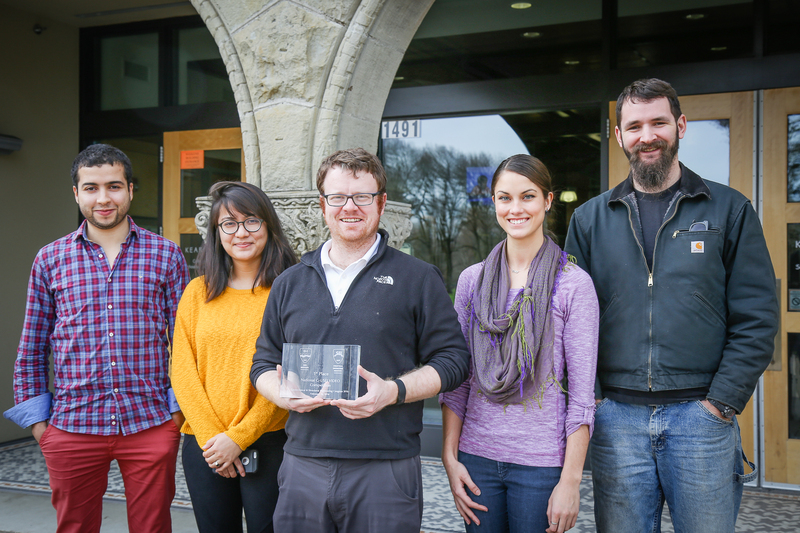 CCE is pleased to announce the new Summer Undergraduate Research Fellowship (SURF) program, which will provide approximately 10 fellowships to support hands-on research toward increasing community resilience in response to Cascadia Subduction Zone (CSZ) earthquakes and tsunamis. During the seven-week program, students will participate in a specific project related to CSZ hazards, learn about engineering for natural hazards resilience, and develop research skills to increase graduate school opportunities. Application deadline: Friday, Mar. 11, 2016, 1 p.m.